The other night I went to hear a great Irish folk band, Lankum, at the Traverse theatre bar. I first came across them in a BBC Alba television programme when they were called ‘Lynched’, a name they have understandably ditched. Their talent stuck in my head, so when I saw they were performing in Edinburgh I went along. The performance was sold out and a large cheerful crowd of all ages, shapes and sizes was jostling for space around the bar tables. Whenever I find myself in crowds like this I always long to sweep them up and take them along to listen to my next concert, for it is so pleasant to be among such an audience. To my ear, folk music tends to be repetitive from the musical point of view, but there are other fascinations. The words usually deal with hardship in some form or another – political, romantic, financial. ‘What will we do if we have no money? Oh true lovers, what will we do then?’, sang Radie Peat with a raw and lonely sadness that hushed the audience. It struck me that the presence of words makes the message so clear. In the instrumental music I usually play, there is just as much emotion and searching for consolation, but it is not labelled. You have to be prepared to go looking for what’s in it, because nobody tells you beforehand that it’s about the rage of the prisoner or the sorrow of the abandoned lover. If you are the instrumentalist, you constantly have to ask yourself how to get the unspoken message across. Not for the first time, I thought how helpful it would be if composers had given evocative titles to their pieces, or put words to their most important melodies. I know why they didn’t, but when I go to folk song performances I rather wish they had. Last week, when I was in Italy, I went to a concert of a well-known ensemble (I’ll be discreet about who and where). Firstly I should say that the large audience appeared perfectly happy with the performance and applauded enthusiastically, but for me as a professional musician there were signs that the players were demoralised. Their body language said so, both when they were playing and when they weren’t. This was, for example, the first time I had ever seen a professional musician chatting on his phone on stage just before the concert, in full view of the audience. Perhaps it’s old-fashioned of me, but I felt it showed a lack of pride in the occasion. Concert dress is hotly debated these days – what message are we giving the audience when we choose this or that to wear? – but this group didn’t seem to have discussed it at all. If they had, they evidently hadn’t been able to agree. Their outfits ranged from dark suit and tie to a denim shirt worn with fashionably ripped jeans. There was someone in a lilac shirt and chinos, someone in pale suede boots, and someone in a smart black jacket with waistcoat and formal trousers. Perhaps it was all meant to look delightfully informal, but to me it said, ‘We don’t know any more what our identity is’. I know how difficult it can be to agree on ‘image’, but to allow such a cacophony of concert clothes seemed to show not so much a relaxed attitude as a lack of unity and purpose. I suppose it was hardly surprising that their playing gave me a similar impression. I knew nothing about the set-up but I could imagine there were difficulties behind the scenes. Afterwards I went for a walk and ended up in a local park. A group of Italian students was sitting under the trees. Eventually one of them got out a guitar, another a violin. Quietly they started ‘jamming’ with a Stephane Grappelli number. And suddenly there was music in the air. Not studied, not expected, not ‘a performance’: just music being played for fun and with natural flair by people who were really into it. I felt myself relaxing. My mood had been a little low, but eavesdropping on this impromptu jazz session restored my good humour. You never know where you’ll find good musicianship! I’m reading Andrew Solomon’s fascinating ‘Far from the Tree’, a 900-page study of parents ‘who learn to deal with their exceptional children and find profound meaning in doing so’. As it happens, I’m currently preparing a lecture-recital about Schumann for 7 October. I’ve been thinking a lot about Schumann’s obsessive musical patterns. Music as an organising defence against the clatter that assaulted him? That makes sense to me. 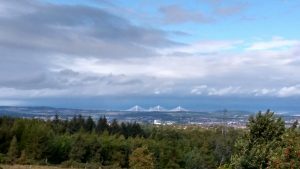 On Saturday I enjoyed reading Ian Jack’s fine Guardian article about the Queensferry Crossing, our striking new bridge over the Forth (see photo taken from the Pentland Hills yesterday). Many of his comments resonated with me, a fellow Scot. He recalled how the previous Forth Bridges were designed and built by British engineers with British components. By contrast, the new bridge sourced its designers, contractors and materials from around the world. A large part of the workforce was local, but otherwise the project was distinctly multi-national. Most Scots would share Ian Jack’s mixture of emotions on hearing that a) the expertise and materials were not Scottish but b) Scotland is successfully reaching out to the world. Ian Jack’s words were still in my head when I was researching the result of this year’s Scottish International Piano Competition which finished yesterday in Glasgow. Its website lists the competitors and the results of the various rounds. If you have a look, you’ll probably be struck as I was to see that the vast majority of competitors were from other countries. On the one hand, I feel proud that Scotland now attracts people from all around the world. On the other, I feel dismayed by the lack of home-grown competitors. Is it really the case that we can’t field candidates to take their places alongside the oustanding young Turkish, Romanian and Georgian pianists who won the top prizes? Recently I came across folders of notes I had made when serving on international competition juries over the past decade or more. Pages and pages of detailed notes on people’s playing. Most of them played for at least half an hour, sometimes an hour, so there was plenty of time to make notes. I did so partly because I knew that competitors had the right to ask for feedback. Most competitions offer an opportunity – usually at the point when a competitor is eliminated – to ask jury members what they thought. It’s unthinkable to have to confess to a disconsolate young musician that you don’t remember how they played. So we were ready with our commentaries. But many competitors don’t ask. If they do, they are not really in the mood to hear feedback, especially if they have just learned that they’re out of the competition. At that point, the competition no longer pays their accommodation expenses and they generally make haste to leave. Some seek advice before they go, but you can tell they’re struggling to listen (and I sympathise). Those who go on to win prizes almost never ask for feedback, which is a pity as I have the most notes about them after listening to them in all the rounds. All this means that I come home with sheaves of notes which nobody ever reads. I can’t just leave them with the competition organisers, because the notes need interpretation, and a bit of judgement about what to say and how. In theory, competitors could write to ask for feedback when they feel calmer, but they don’t. I remember only one occasion when, weeks after a competition, a chamber group contacted me from a faraway country, asking in very halting English if I could explain why they didn’t get past the first round. Luckily, I could: I remembered them quite well, and I had notes on every piece they played. I transcribed my notes into clear sentences and mailed them a report. I never heard from them again. Some organisers try to graft educational opportunities onto music competitions, but the two are uneasy bedfellows. The fact is that competitions are not primarily learning opportunities but rather beauty pageants, designed to produce winners and losers. What is ‘learned’ is often hard to digest. What to do with all my notes? Everyone will have moved on since those competitions. Many of the groups won’t be playing together any more. The notes are going in the bin.